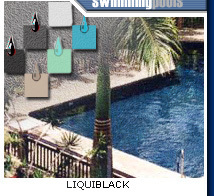 Liquid colors create beautiful plaster either for a smooth plaster pool or as background for pebble, quartz, or other applications. We make custom colors. If there is a color you want, ask us. We enjoy hearing from you. All of the colors shown above are quick and easy to measure and mix. Generally one gallon or a concentrated quart of color per batch will achieve the color pictured. For lighter shades, use less liquid pigment. For darker shades, use more liquid pigment. A typical pool mix is a 4-sack mix: 600 lbs. of white sand and 4 bags of white cement (94 lb. each). Include color when measuring liquid. Many re-sellers around the country carry our liquid colors. Check our Color Suppliers page for the location nearest you. If no location is convenient, contact us.